BRUSSELS—With the recent completion of the European Union’s Clean Energy Package (including the revised Energy Efficiency Directive, Renewable Energy Directive and Energy Performance in Buildings Directive), the EU continues to implement measures aimed at driving the necessary investments to provide security of supply, while decarbonizing the European energy system and supporting energy production from renewable energy. In order to complement this recently finalized Clean Energy Package, the European Commission is now focusing its efforts on ensuring the world does not exceed a temperature increase of 1.5°C and identifying key focus areas to fight climate change with a new Strategy for a Climate Neutral Economy by 2050. A 2018 UN climate science panel report concluded the world has already warmed by 1°C since pre-industrial times due to human activity. If the current pace of warming continues, the report stated, it is likely to pass the 1.5°C mark between 2030 and 2052. There will be worse heatwaves, drought and flooding at 2°C compared to 1.5°C and sea levels would rise 10cm higher this century. 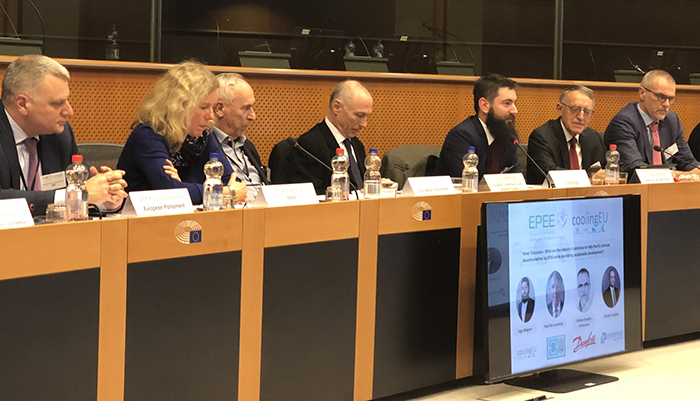 The scope of the problem along with technology and public policy solutions were presented at a briefing organized by EPEE (European Partnership for Energy and the Environment) and coolingEU (a cross sectoral platform uniting associations from the cooling and refrigeration sectors). Panelists describe EU’s pathway to decarbonization. Paolo Bertoldi with the European Commission’s Joint Research Center said the EU has made climate change one of its top priorities. Adaptation strategies are needed at all levels of administration—local, regional, national, European, and international level. Due to the varying severity and nature of climate impacts between regions in Europe, most adaptation initiatives will be taken at the regional or local levels, he said. Technology solutions are available. But the answer lies in more than finding ways to improve equipment efficiency, said Paul de Larminat representing the Global Food Cold Chain Council. “Machines are near to the maximum extent of their efficiency. The laws of physics limit what is possible,” he said. De Larminat called for reducing thermal load, looking at system efficiencies, and using common sense approaches to further reduce energy consumption. “We need building envelopes, closed door display cabinets, for example. And unlike electricity, thermal energy is easily stored. We need to shave peaks of mismatch between supply and demand of electricity through use of renewables.” De Larminat envisions thermal energy distribution grids and integration within smart interconnected systems. 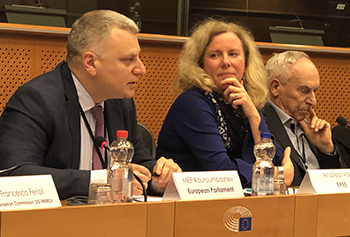 Member European Parliament (MEP) Peter Kouroumbashev, Andrea Voigt, and MEP Adam Gierek.